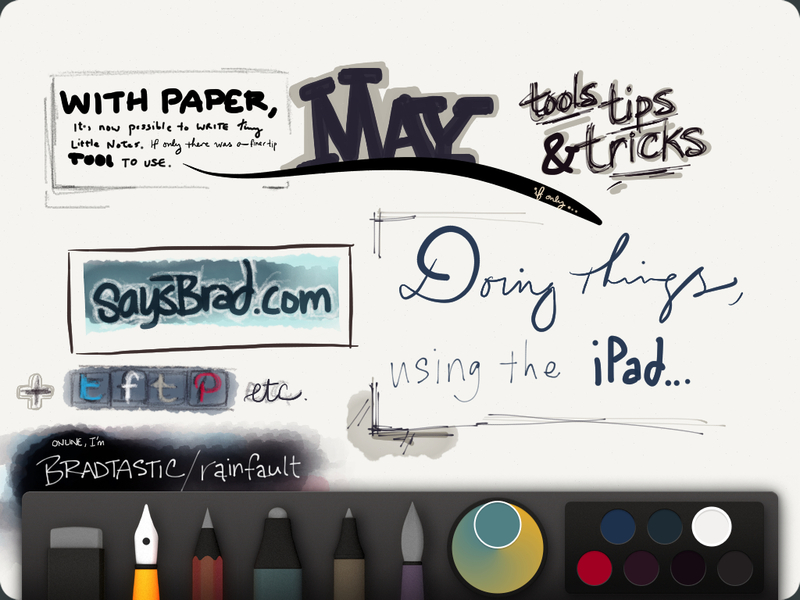 Inkblogging on iPad mini with Wacom Bamboo stylus. Tried writing block print and cursive (ink blogging, note-taking) on the iPad mini again, although this time, I used Wacom Bamboo Paper - Notebook iOS app instead of Penultimate (Evernote). The resulting handwriting still looks fairly hideous; that said, it's much nicer than Penultimate. The Wacom app has pinch-zoom magnification, but using it is finicky; often when I try to pinch, I end up drawing a line on the screen instead. Hopefully Wacom can fix this. As a note taking app, Wacom's Bamboo Paper - Notebook isn't too bad — especially for free. It doesn't compare to the premium apps such as Noteshelf, but it is functional. On the full-size iPad (retina), it's actually pretty nice. The color palette, while limited, offers some nice options. Wacom obviously took time selecting attractive, complementary colors. Despite originally being designed as an eponymous companion-app/marketing tool for Wacom's Bamboo capacitive touch stylus, 'Paper Notebook has gone through several major iterations and feature changes — the recent iOS7 update being the most substantial and significant. Wacom added new drawing tools, paper styles and notebook covers, as well as support for their new pressure sensitive (2048 levels) Bluetooth 4 device, the Intuos Creative Stylus for iPad.. The drawing tools and artist notebook set is available as the Creative Pack for $3.99, and everything is is offered at $0.99. In the image above, I used only the two standard free tools and free paper type. I love the iPad mini; mostly because of its lightweight design and rounded edges (the iPad 3 has narrow edges, making it uncomfortable to hold without a nice case like ones made by Incipio), but I don't like drawing on it. In addition to the lack of retina display and slower processor, narrow margins on the left and right side of the screen makes it difficult to draw on-the-go in landscape mode because my palm ends up making contact the edge of the screen (doesn't happen to me when using the full-size iPad). I also created some handwriting samples on my iPad 3 (Retina display) for comparison that I'll post later. I used the same two apps with very different results. The process of drawing and writing on my iPad and iPad mini side-by-side has confirmed that the iPad mini (first gen; I hope Apple releases a better, retina version soon) isn't a great visual artist's tool. Worth mentioning: great tools, great devs. Note: If you like creating vector art using software like Adobe Illustrator, Inkpad by Taptrix is still free (normally $4.99)! Inkpad is the best vector tool I've seen for the iPad, and it's been updated for iOS7. Have you tried Inkblogging from an iPad? If you have, I'd love to see it and share it with people. If we can encourage more people to draw, the world would be a better place... and if more people used iPads for ink blogging and handwriting, we might be able to convince Apple to release a special active digitizer iPad! Just a thought. Warlords Classic for iOS, Free! If you're into old school strategy games, grab this now! It's still free — but probably not for long. It's less than 9MB, so you can download it (and play) on-the-go. I don't think I'll spend much time with this one, so let me know what you think! (I never played the original!) I think I'd rather play Baldur's Gate: Enhanced Edition, however. Two Fantastic Free iOS Apps! My recent posts, and some soon to follow, are quite serious — but saysbrad isn't becoming a pure-politics blog! I'm writing a review of two great note-taking apps gone free! Scrapnote (iPad, was $4.99) and Jotter (universal, was $0.99), both by groosoft. I'm not sure how long these apps will remain free, so instead of waiting for my reviews, you should go download these apps! Oops! Scheduled post failed, so it didn't post in May! I do just about everything from an iPad. Recently I stumbled upon a site called AppSumo, a collection of lifehacks and productivity tools/info, primarily for entrepreneurs and small businesses. Browsing the site led me to rethink email and task management, calendar planning and organization. I've been sort of on the fence about Gmail, unsure of what to think or how seriously to invest in it. As a platform, there are wondrous components to Gmail via Google Labs and integration with all of Google's apps (Android and Google Glass eyewear also pretty cool). But I also think that there are reasons to be hesitant, or at least vigilant. So I have email boxes at all of the major services, for various things. Yahoo was a big deal at one point, and they may be again, buying tumblr. (I still haven't figured out how to effectively use tumblr, however.) XBOX LIVE requires a Microsoft account so there's Live mail (used to be Hotmail, is now Outlook.com), dot Mac turned into MobileMe followed by iCloud… it's tough to keep up with it all and keep it all straight. All made more complicated (difficult) being limited to an iPad and iPhone 4. At least Siri helps — a bit. So in my quest for some semblance of order, some quieting of the chaos, I turn to apps. Shortmail is a unique concept: keep emails under 500 characters. Recent updates to the service allow attachments via Evernote and Gmail linking; any email under 500 characters goes to shortmail, over and it's sent to gmail. Each shortmail.com address is based on your twitter account handle, but you can also make up your own shortmail.me address. I don't know how much traction it's gained, but I like it and hope to use it more for quick conversations when text messaging isn't an option. My main email box gets cluttered with too many messages. Shortmail is quicker. I just wish they'd release an iPad app or universal update. Mailbox is beautiful, minimalist and intuitive — and I'm excited to see where it's going. I already prefer it to the iOS Gmail app, and in some ways it's nicer than the native Mail app. It's new (so don't expect it to be perfect) but I haven't run into any issues other than a lack of portrait mode (it's landscape only on the iPad). It would also be nice to be able to edit/add labels and move/archive/delete messages in bulk. I hope developer Orchestra, Inc. adds Outlook.com mail support! Email is the digital equivalent of physical mail, right? An inbox is like a physical mailbox — except people don't leave envelopes stuffed in their mailboxes after receiving and opening them. For many, myself included, getting that Inbox to "0 messages" is a battle, a constant effort — time-consuming. Frustrating, even. Often, people just give up and let messages accumulate, or they don't care to sort messages. Over time, Inboxes can collect thousands of messages, and this inhibits usability. Say you're searching for an email about an event, but you can't remember what that event was called — perhaps it was six months ago and you're looking for some pics from it. If you have a cluttered mailbox, the keyword "event" could pull up hundreds of messages, most of them unrelated to your intended query. An organizational system can alleviate this frustration. Search doesn't always function properly when there are too many emails to sift through. If you store emails locally (on your computer or device), those emails take up space, and searching takes up memory. If you use cloud or IMAP mail, those messages take up server space and extra bandwidth to search through. A large inbox — messages unfiltered and unorganized — takes longer to download and thus, search. These two apps can help you clean up your inbox. Both services offer tips on how to do this, and in the future I'll make a post about Google features for automatically sorting emails and something they call "canned responses." 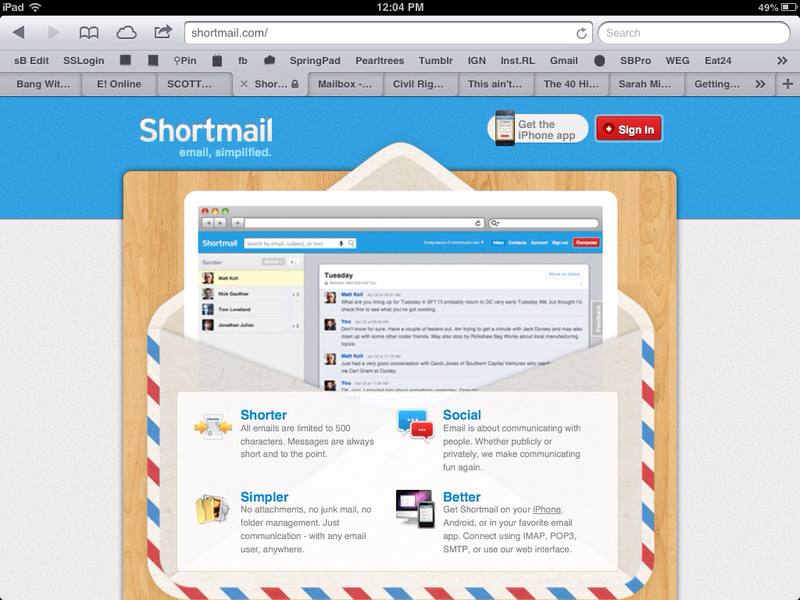 For now, take a look at these two apps, Shortmail & Mailbox, and tell me what you think. If you have email tips and tricks, I'd love to hear about them!